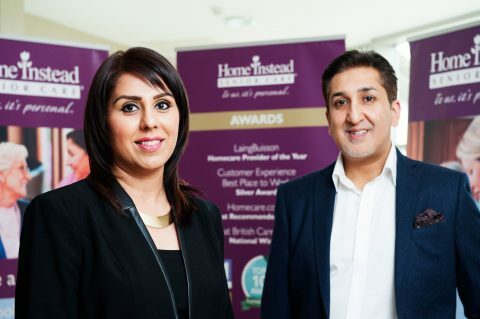 When Tasnim saw the success of her husband’s Glasgow North Home Instead franchise – she decided to call time on her job in retail and embark on a second career in the homecare sector instead. Tasnim opened up the Glasgow South office, the neighbouring territory to Suhail – making the entrepreneurial couple franchise neighbours in turn. April 2017 will mark one year since Tasnim made the move into the Home Instead network. And she says she has never looked back since, despite 14 years working her way up the retail career ladder with some major global brand names including Chanel. It was the Home Instead ethos that Tasnim experienced through Suhail’s franchise journey that started to call her away from a ‘lifetime’ in retail. She said: “I was seeing the difference my husband’s business was making to people’s lives, how the Home Instead care model was truly helping clients and their families in turn. I was still working in retail but I was getting the Home Instead ethos by ‘osmosis’ you could say via Suhail. Tasnim opened her Glasgow South office in spring 2016, becoming the brand’s 4th Scottish franchisee at that time. As she opened her office, Suhail was on his way to a £1 million turnover business, having opened the Glasgow North office in 2014. “Franchising isn’t as big in Scotland but I knew it was the answer for me. I wanted a proven business model not risk. I’d looked at all kinds of franchisors from Domino’s to Pizza Hut when a friend suggested homecare. Home Instead Senior Care has 5 franchisees flourishing in Scotland to date and 23 available territories including: Inverness; Perth; Stirling; Dunfermline; Dumbarton; Kilmarnock & Irvine and Ayr. Suhail will be sharing more details about his franchisee journey and passion for excellence in the senior homecare sector as part of Scottish Franchise Week. He will be one of four franchise sector panelists at the BFA’s Business Breakfast from 7.45-10am on Wednesday 26th April at the Radisson Blu Hotel, Glasgow. Added Suhail: “Franchising is clearly a growth market in Scotland. Out of over 900 franchises in the UK only around 500 currently operate in Scotland. This represents a great opportunity for potential franchisors and franchisees looking to enter the market and tap Scotland’s vast entrepreneurial and management wealth.